Going Up and Falling Down. This week I put the final greyscale touches to a short story called 'Book' that has been illustrated by Steve Holder. This will form part of a collection of short comic strips that will come out later this year, in a little hardcover book called Robot Shorts. Steve talks about this strip over on his blog. As is always the case with me at the moment, a lot of things seem to come together in very surprising ways. Reading back through pages that I'd already lettered, changing bits here and there as I do, my eye was drawn again to this great image from Steve. It reminded me of my youth, growing up in a block of Flats (Tower Blocks) in South East London, although the locals were a little less intimidating. My new job sees me moving between two towers in the centre of Manchester, and I always seem to be having to go up to at least the 9th Floor in each. I therefore have to use the Lift (I'll use that term as it seems more British), in order to get to where I need to get to, at the right time, and sweat free. I always feel a little seed of apprehension when I enter the Lift. Will there actually be a Lift behind the opening doors ? Will the lift get stuck somewhere between floors ? My experience to date has not been great, though far from catastrophic. I rushed past a women to jump into a Lift that actually went down rather than up, only for her enter the same lift, giving me a rye smile as it came back up to my original floor again on its way to my intended floor. I've stepped into a lift, pressed the button, lost myself in thought and then stepped out of it as the doors have opended, only to find myself on the same floor that I left, the Lift having gone nowhere at all in the intervening minutes. I've stepped into a Lift and pressed the button for my floor, only to have it make a very strange whirring sound, causing me to jump back out between the closing doors. I'm not sure where this slight phobia comes from. 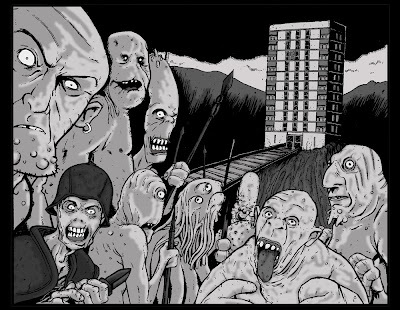 I never had any real problems with the Lifts in the tower block of my youth. Sure I've heard some horror stories, but not many and none that I can remember in detail. 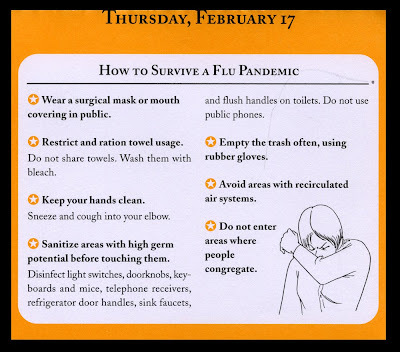 So it was odd that this week's Desk Calendar had this advice on the subject. 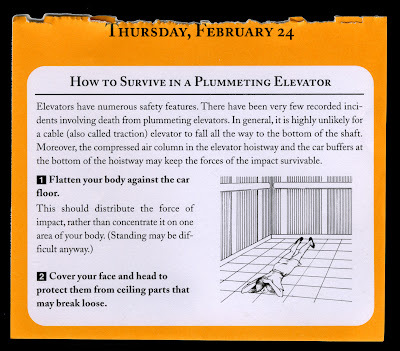 I'd always thought the best thing to do in a plummeting Lift would be to jump as it hit the ground. Easier said than done I know, but that's probably what I'd have attempted. Now it looks like the best thing to do is to lie down. I'm not sure how practial this advice is as there are usually about 10 people in the Lift and I don't really think that everyone would fit if they all tried to lie down in it. Should I be first in that case, or last ? Would it actually help at all ? Maybe I should allow more time for my journey and take the stairs, a much healthier option for all sorts of reasons. Bugs, and their part in our downfall. 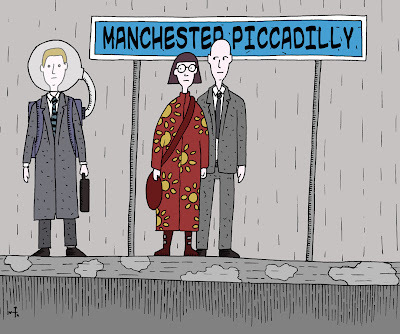 The train pulled into Wilmslow station as it did every morning on its way to Manchester. It was a cold morning, causing even the hardiest of the waiting passengers to wrap as much of themselves as possible with scarf, hat and glove. And yet, with all that protection, the man who sat himself only two rows ahead of me sneezed as he allowed his body to drop into the seat. With sitting in a train every morning and night I guess it's just a matter of time now before I too succumb to some flu bug or other. I had one only a few months ago, around Christmas as I recall, and yet I know that in the intervening months the little blighters will have evolved into something entirely new and overpowering. Strange then that once again the little desk calendar had some great advice for me. The 'Do not enter areas where people congregate' is a tough one, as I couldn't imagine the pain of driving into Manchester every morning... well actually I can, which is why I take the train. 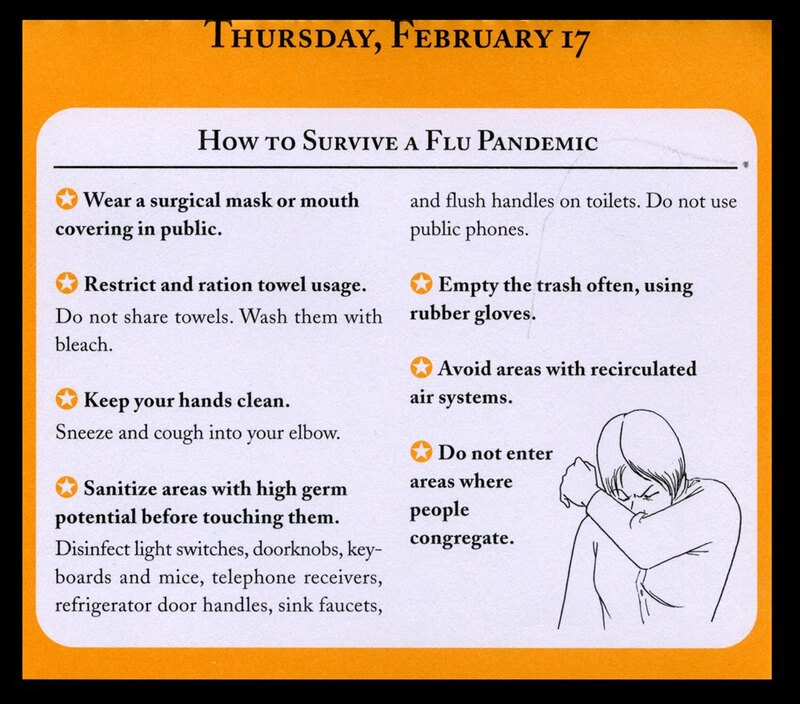 'Wearing a surgical mask or mouth covering in public' just isn't something people would do in the UK. It's just not... British. Maybe I could design something... no... I'd end up looking like someone dressed in a poorly constructed spaceman's outfit. As I left the train, joining the hundred or so commuters as they set about getting into their workplace as quickly as they could, I wondered about the end of The War Of The Worlds. How the bugs (and by this I mean 'germs') had saved us by killing off creatures who had no natural protection against them. Had Mr Wells been prophetically warning us ? Of course, I'm more of a 'glass half full' kind of person and so my thoughts quickly turned to the day ahead, and the realtive warmth of the air conditioned room in which I'd be spending most of it... Oh, isn't there somewthing about 'avoiding areas with recirculated air systems' in that 'How To Survive a Flu Pandemic' ? This week, sat as I was amongst the germs on the Manchester boound train, I finished reading abook that Owen Johnson had sent me. A book he described as 'his favourite book'. A book that is very thick and pretty heavy. A book called 'The Amazing Adventures of Kavalier & Clay' by Michael Chabon. A book that is wonderfully written, engrossing, hopeful and sad. I can't remember when I've read a better book, and this one was actually about comic book creators as well. Set against the backdrop of the Second World War it follows the plight of the Jewish people as it observes events in Europe from the perspective of a man who has managed to escape, physically if not mentally, the fate of many of his people. I would recommend this book to anyone. It really is an excellent read. It does trouble me though that just as I finish it, I'm pointed at http://www.bleedingcool.com/2011/02/19/this-kavalier-and-clay-animation-test-is-exciting-and-unexpected/ by Dan of Millennium Comics. I'm sure they must be talking about making an animated movie of the comic characters within the book, and are not trying to capture the story of the creators of the characters themselves. I hope that they are anyway. It would make a great movie, but would lose too much if reduced to animation. The other book I finished this week was Revolver. This one had pictures and was written and illustrated by Matt Kindt. It's a great little tale about an otherwise typical man who bounces between two very different realities. I'll say nothing more about the plot, you'll just have to go out there and find yourself a copy. The harcover collection is very nice. In other news, I've started an Accent UK blog for all future News, Diary and Event information, phase 1 of the Accent UK website upgrade. You can pop over and check it out at http://www.accentukcomics.blogspot.com/. Buildings, and jumping across them. It's been a while since I've worked in a city, and I find myself looking at the buildings around me as the train draws into Manchester and I put my book away. There are some really interesting buildings all around us. I tend to get drawn to the older ones myself, the ones with the interesting shapes, strangley constructed and yet functional rooves. Windows that stand proud of the walls, floors that cover a slightly larger area the higher they get. The names of their original purpose carved into their stonework, rather than being fastened to the outside by rust prone screws. There's a real permanence about these buildings that I just don't see in the newer ones. So as those around me rush to their workplace with their heads down, I rush to mine with my head raised, enjoying these buildings and wishing that we still built structures like them, rather than the boxes of steel and glass that is the current fashion. And then I spot some strange marking, drawn in chalk next to an old door on one of these old buildings and I find myself looking for others. Is this some kind of code ? Is there some society moving around amongst us using their own language ? Signalling safe houses to each other ? Or maybe it's nothing more sinister than a workman indicating the depth and position of a water main, running beneath the building at some unexpected depth or angle. It certainly isn't Bobby Doyle marking cleared buildings. 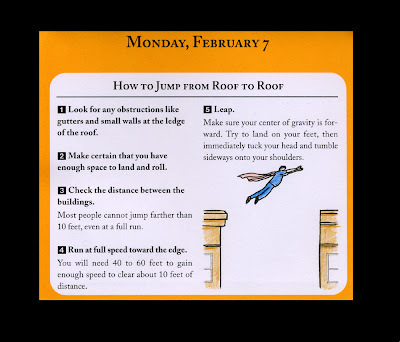 OK ... so I changed the diagram a bit, but good advice for any would be superhero, who hasn't the ability to actually fly. And it occurred to me that a masked character running across the rooftops of old Victorian or Edwardian buildings has so much more visual excitement to it than the same character trying to leap from one skyscraper to another, even if the latter would by much more perilous. Maybe I need to write a story about a Victorian Superhero and get it out of my system. Friday night Andy, Colin and I got together to discuss where Accent UK is going and what we need to do to keep growing. We meet every now and then in a local pub, an old building with a very low ciling, full of character... and characters. We have a lot of projects in various stages of development, and we have that side of things pretty well managed I think. OK, we'd like to publish more books every year but in the declining market we're sticking with our model. I guess the two things that we did agree we need to look at, and have been discussing with Owen Johnson the last few weeks, is that we need to get into the Digital Comics market with our books. ZOMBIES has pretty much sold out, we're keeping a few copies back for Mocca in April but apart from that the comic is done. It'll be a shame not to keep it in print but there are risks with doing that, in that we've already sold a lot of copies at Conventions and stores and so it'll take much longer to sell another 1000 copies or so, which ties up a lot of our cash. The result of not re-printing is that the creators who contributed to it will have reached their total audience, with no new people enjoying their work. Going digital seems a good way or keeping the books available to new readers without the extra print costs and storage problems that paper copies bring. I'll be looking into this over the coming months, but any advice or guidance anyone has will be greatly appreciated, just add your comments or thoughts to this posting. The other thing is that we need to freshen up our website. I'm no web-designer or coder so this is something that will take a while to manage I think. Again if anyone has any suggestions then I'm all ears. As far as the EAGLE awards go, it's great to see that someone has nominated Andy Bloor for Best Newcomer Artist, I wish I'd thought of that. If you haven't voted for your favourites of 2010 then pop over to http://www.eagleawards.co.uk/ and cast your votes. It's one of our institutions over here in world of UK comics, the more votes all round the better. This week was the week of my 'Leaving Do'. Tuesday night I was picked after getting back from work and taken to a local pub where a lot of the friends I'd made over the last 24 years where waiting to see me off. It was a really enjoyable, if a little sad, evening chatting about the past and the future, and having the odd beer. I noticed one the guys, Mark, enter the pub quite early on with a huge wrapped picture frame under his arm. And I started to worry. Was my leaving present to be a huge aireal photograph of the building I spent most of the last 24 years working in ? Would I have to bring it out and hang it up whenever anybody called around ? How good would I be at looking pleased by the gift when presented with it ? I'm not a great actor. People get to know a lot about you when you've worked with them for such a long time, as the references in this picture show, and whilst it was Mark Dodgson who had had the initial idea and sorted most of it out, I can see that a lot of people contributed to the content of the image. It'll be hard for you to spot some of them on this very small version but there are plenty in there, and I keep finding myself studying it. It's fabulous. 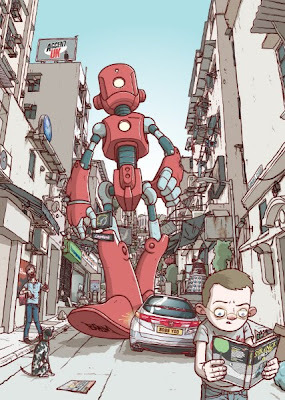 The artist is known as Hammo, I've added a link to his blog on the right, and he can certainly draw a great robot ... and 'Yes' .. that's a young Dave West reading a copy of Strange Times and 'Yes' that's Bobby Doyle on the rooftop. The other great thing to happen this week is that The Fall Of The Wolfmen has been nominated for an EAGLE award. As with previous years the first round of voting is merely to get the list down to a shortlist of 5 entries in each category, and the final date for this is the 7 March. then from the 17th March the voting starts again where one of the final 5 will be the winner. It's a little bad timing for us as the comic has only been seen in the UK so far, apart from review copies sent out, but hopefully the comic will hit stores across the globe before that date, we'll check our Diamond shipping details. Also, it's great to see the Tales From The Parent's Basement podcast listed, it's a great comics podcast run by guys how just love the media, and happen to be really nice blokes. The Man Of Glass wasn't on the list for Best UK Colour Comic, but I cheekily added it. If you don't see it by the time you go in and cast your votes then feel free to add it as well, but only if you really think it was better than the others on the list. And here's my request ... please don't vote for our books out of friendship, please only vote for those books you really think were the best. That's where this system is flawed, but it's all we've got so let's respect its limitations and not take advantage of them. Thanks. 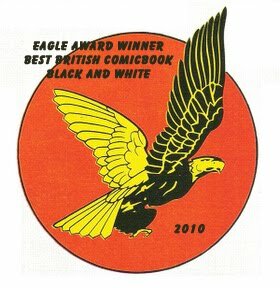 Oh, the link to cast your votes is www.eagleawards.co.uk.